Thread: Show me your vintage Amphibias! Re: Show me your vintage Amphibias! elsoldemayo, mariomart, dinkan and 4 others like this. Hello comrades, I' m a Russian watch lover (not a seller) , ), I've been collecting watches and learning English at the same time during the last decade, taking profit of the crisis (free time). I attach here my group of amphibian watches hope you like in the same way I love them. Last edited by bultacolobito; 1 Week Ago at 08:42.
elsoldemayo, PDAdict, dinkan and 8 others like this. A very nice collection Bultacolobito! 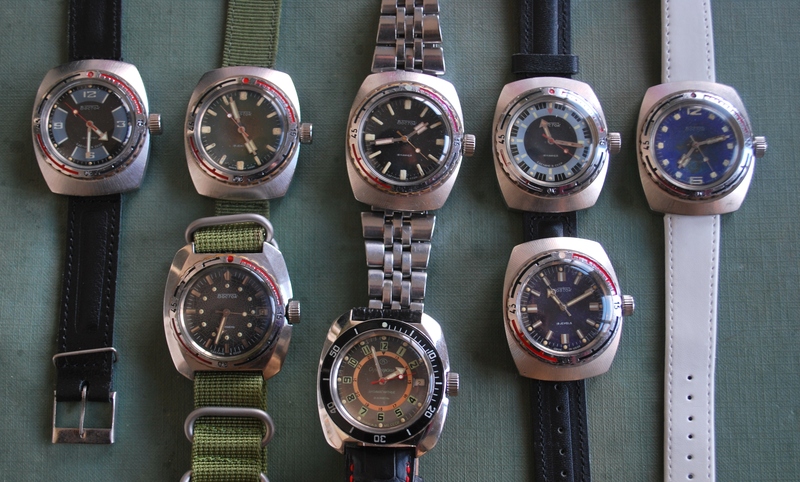 It's good to see that there are other collectors that has discovered the charm with the Russian wristwatches. I like your trio of NVCh-30 of course. 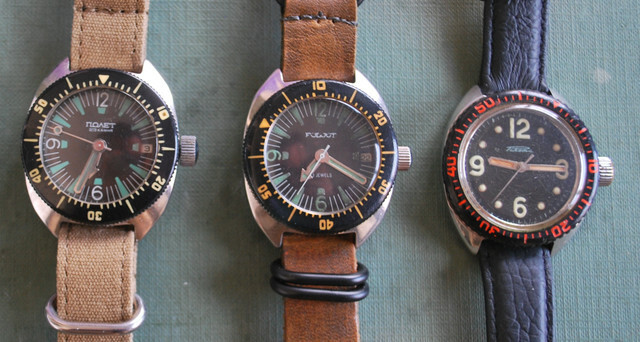 The group of Vostoks in the type 350 cases are also very beautiful. 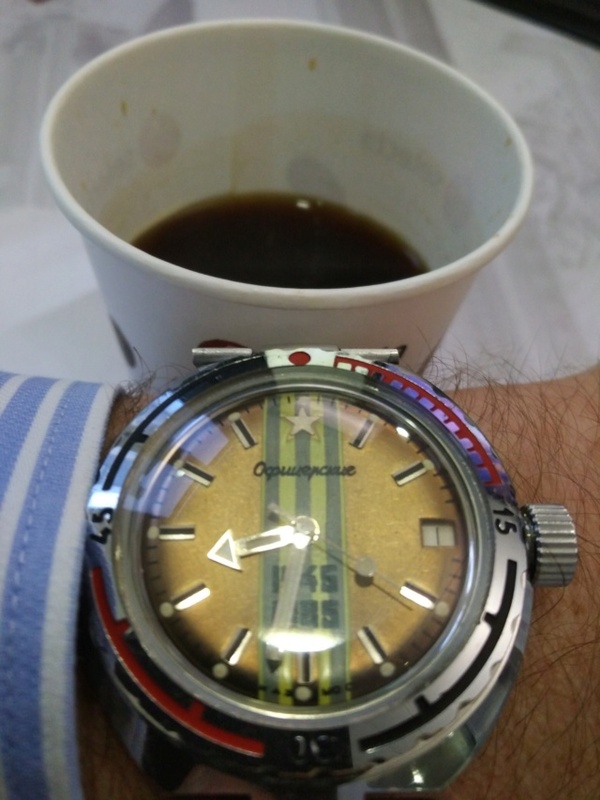 I notice that you also have the stamp Zakaz MO CCCP on the dial of your rare Oficerskie. Never seen that text on another dial in an Amphibian case, I think. Thank you dinkan, That's right , I noticed the same, not any more. So many great watches : Those NVCh and Amphibian 350 are amazing & as a fan of big “Soviets” I admire the Tonneau cases you are showing us . BTW, nice variation of the Poljot Amphibia with the non-lumed numbers as well ! Fantastic collection Bultacolobito ! Thanks for sharing with us . lobito74 and dinkan like this. There is this one as well, in a Neptune case (sorry for the bad photo). As far as I am aware of one these are the only zakaz-marked Amphibia. bultacolobito, dinkan and RedFroggy like this. You are right thewatchadude , both are relatives, they are both Oficirskies.